The Honeybee Democracy book will be part of my November 30, 2011 Leading from the Middle workshop in Riga. The bee (“humanity’s greatest friend among the insects”) illustrates the concept of the “leaderless” organization and offers us several tips on how boss-less groups of humans can make good decisions. 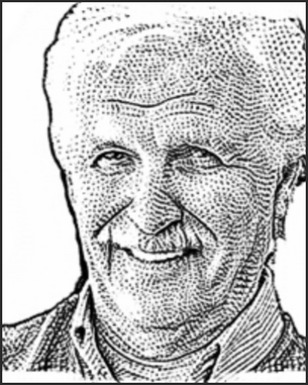 Thomas D. Seeley, the biologist author, observes: “Remarkably, the scout bees do all these things without working under the guidance of a leader.” And, Seeley’s research demonstrates that the bees pick the optimal new home 4 times out of five, a success rate of 80%. While each chapter makes for fascinating reading, the epilogue (pp. 233-236) condenses the bees’ process of leaderless decision-making. 1. No dominating leader, one who can shut down discussion or censor any dissenting views. There are tradeoffs: no one to state the purpose of the discussion, nor someone to define the groups method of decision making no chairman to keep the group on track, nor a firm hand to foster a balanced discussion and bring the meeting to a conclusion with a decision made. It's all up to the group. 2. A strong incentive to make a good decision (survival!) While our mere mortal decisions may not be life or death, there are some decisions crying to be made. As I write this, the several month old Euro sovereign debt crisis with its queen bees at cross purposes - imagine Silvio Berlusconi et al. in bee costumes and you get the idea. Update: as of this afternoon, yet again, a "solution" is proposed: “It remains a deal long on intentions and short on detail....” Send in the bees! 5. An agreement among all about what the problem is (a new home) and the protocol to be used in making the decision for a new home. 1. Find multiple locations for new homes. (They have to find, explore, and analyze each possible new location, the new idea for a solution. 4. Reach an unanimous choice of the one best site – no dog-in-the-manger bees allowed! portal: “Librarians of all stripes are encouraged to read these essays”. When I submitted the manuscript to my good friend Art Young for his thumbs up or down, I told him if he liked the ms that would nice; if he did not, that would be OK, too. I meant it. The book really is my personal story of what and how I think about leading, managing, & following. It's based on my experience with some of the best leaders and followers and some not so great. I wrote the book for myself and figured if Art said NO, I would run off 30 or so copies, bind them, and give them to friends and family - what a Christmas present! Hah! Well, Art wanted the book and a year later ABC-Clio put it out. They have been a fine publisher from copy editing (unheard of among some publishers, I am told), cover design (I love the design), publicity & exposure, and in their follow through on my many questions and suggestions. I have been very pleased with how the book has been reviewed. Of course I am pleased with a review that says kind things and suggests the reviewer has read the book. What I really mean by being pleased is that the book was reviewed at all! So, the half dozen or more reviews, starting with one in American Libraries within a few months of the mid-2010 publication date, have been icing on the cake. Also, I have been impressed with the thought most reviewers have put into what they say and I am happy that these several voices have joined me in discussing the pros and cons of a democratic workplace. Beatrice Coron, the NYC paper-cutting artist par excellence, also teaches at the Penland School of Crafts in the North Carolina mountains. 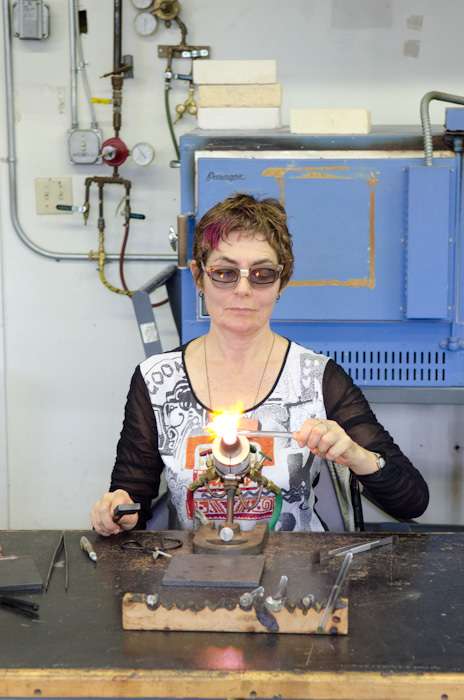 She linked me to a fascinating Penland blog entry about a recent instructors’ retreat in which she was a participant. One of the activity options was for instructors to experiment with different media, to explore new materials or to use tools they don’t normally have access to leave the familiar and to step into the not so familiar. Here’s Beatrice, sans Tyvek paper and X-acto blade, working in the flame studio. 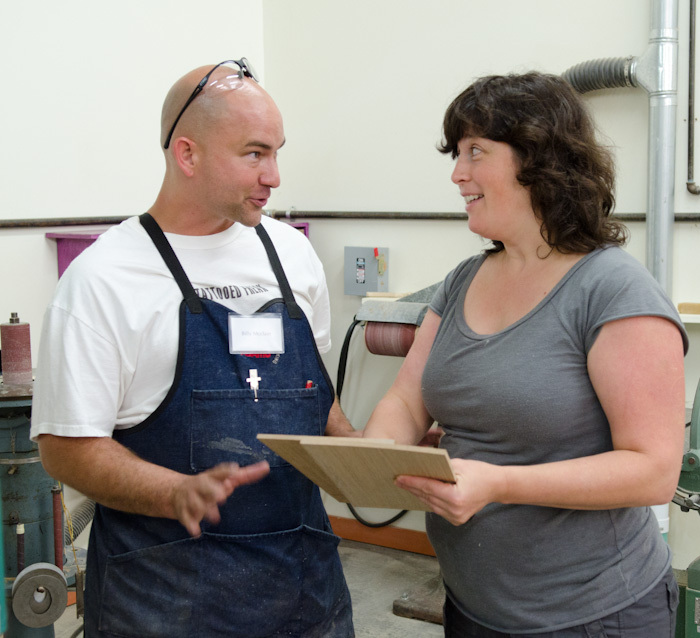 Another picture lifted from the blog: Photographer and book artist Heather Wetzel getting some help in the wood shop from assistant Billy McLain. Of course, I admire Beatrice and anyone else confident enough to try out a new approach, anyone willing to reconfigure their routine, to go through the angst of acquiring new skills, and to reframe how they work. I’ll have to ask Beatrice if the flame shop experience influenced her paper cutting in some different way. (I asked and Beatrice told me: "Well! I'm tempted to say the possibility of burning and melting the material.. . we'll see if it translates into the work. I also experimented with marbling, forging, mannequin making and paper making with papercut inclusion. For sure, that week gave me a renewed energy about my work and the desire to collaborate with other artists and experiment more." Let's develop retreat activities like this for our workplaces in which staff and managers try out new jobs and new ideas without too much risk. (For example someone sitting in for me and writing a answer or two for the Suggestion/Answer book. ) Just learning, hands-on, a sliver of what a colleague does in our workplace could be refreshing and insightful. We’d at least have a better understanding of what that other person does, and we could well learn something relevant to what we do, something we might transform for the better. I am scheduled to do a repeat customer services workshop in Riga, Latvia at the end of the year, so I have been keeping my eyes open for fresh experiences to help illustrate the concept. As we all know, customer service suffers from its clichéd and cynical use in both the for-profit arena and the so-called service sector. The Riga workshop will be for retail shops and vendors, especially museum stores. When I first went to New Orleans 40 years ago, the little gift or bonus from a merchant, was much more frequent than it is now. So, how wonderful to encounter lanny-yap once again and to see how it can transform a so-so hotel experience into something charmingly hospitable, courteous and giving of the human spirit. I stayed, with four friends, at the Quality Inn on O’Keefe. TripAdvisor, the travel reputation site, helped us find this inconspicuous hotel. Its favorable reviews halted us from flitting past; we paused and decided to give it a try. I have stayed in plush multi star hotels in New Orleans and I have stayed in some of the most dismal. Because I am a frugal traveler, finding a good deal (cost and hospitality) in New Orleans has not been easy. As of today, this Quality Inn with its unimpressive façade and kitschy lobby is rated as the number 1 place to stay according to over 280 traveler reviews. It competes with 146 other hotels, some among the best in the industry. - Lobby staff, at the desk and in the lounge area, were always AWARE of my presence. They were not intrusive, they were responsive. - On check out, the staffer knew the airport shuttle schedule better than I did. I had checked out an hour early by mistake! The staffer asked me if I would like to wait in my room instead of the lobby. I said yes and she rekeyed my card so that could happen! - One day, my friends and I were gathering in the lobby heading out for a hike to Audubon Park. The manager offered each of us a bottle of water for our hike! Does what I experienced at the Quality Inn transfer to the work place? Of course, we only have to have that intuitive response of being kind, of being helpful. It need not be innate. It can be acquired. It can become a part of the organization’s DNA. Ultimately, anything that reduces the quality of lagniappe reduces the sense of value and appreciation of and by the customer.